Because I was making two baby quilts basically the same, I decided to take some photos to show how quilting makes the quilt and brings it to life. While the term ‘quilting’ covers the entire process of making a quilt, it also refers specifically to the stitching used to secure the three layers together (the quilt top, the batting, and the backing fabric). This stitching can be very simple (straight lines in the seam lines — also known as ‘stitching in the ditch’ or SID), or can be very elaborate, with lots of stitching motifs or patterns enhancing the design of the quilt top and/or its fabric. Quilting can be done ‘free motion’ (no markings, no rulers, no pattern to follow except what’s in your head or how you guide the fabric under the needle — think of doodling with the needle being a static pen and the fabric sandwich being the paper that you move under the pen… try it with a real pen and paper to see how hard it is! ), or can be done using markings, rulers, and other tools. I reckon life’s to short to mark quilts 😉 so I prefer free motion quilting (FMQ), which means not all my lines are perfectly straight, not all my circles are perfect circles etc. I’m looking for an overall ‘feel’, not perfection, so I’m OK with slightly wonky lines — in fact, in some quilts I’ve deliberately stitched wonky lines for effect (see this one: https://rhondabracey.com/2014/04/21/community-quilt-137/). In this first photo, I haven’t done any stitching to hold the layers together — I’ve only joined (basted) the layers together with pins, ready for stitching. If I only did SID, then those wrinkles and puffiness would remain with the quilt forever. 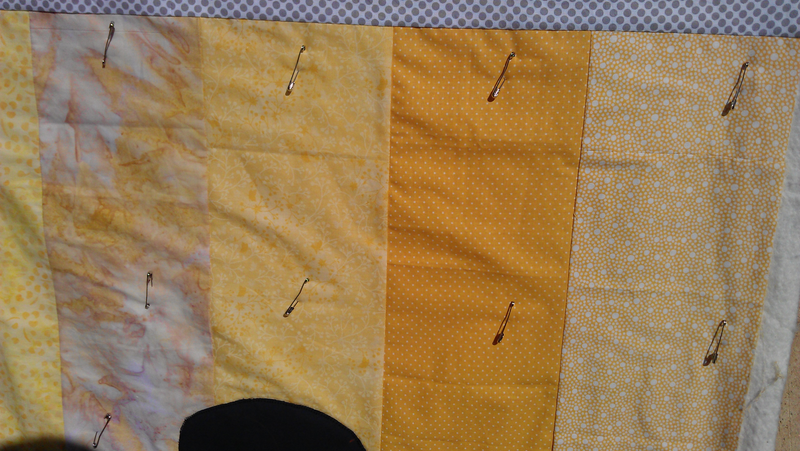 You could iron them out to a degree, but essentially, what you see is what you’ll get once the quilt is finished. It doesn’t have a lot of ‘life’, in my opinion. In the next photo (below), I’ve quilted the the three layers together quite densely, using a free motion spiral motif, with joining long U shapes (I was trying to emulate the hot sun on the African plains). The wrinkles and puffiness have been stitched out. While this quilting is quite dense (there’s not much more than a quarter inch gap between each stitching line), this quilt should hold up well to many years of laundering as the chance of the layers separating is pretty slim. 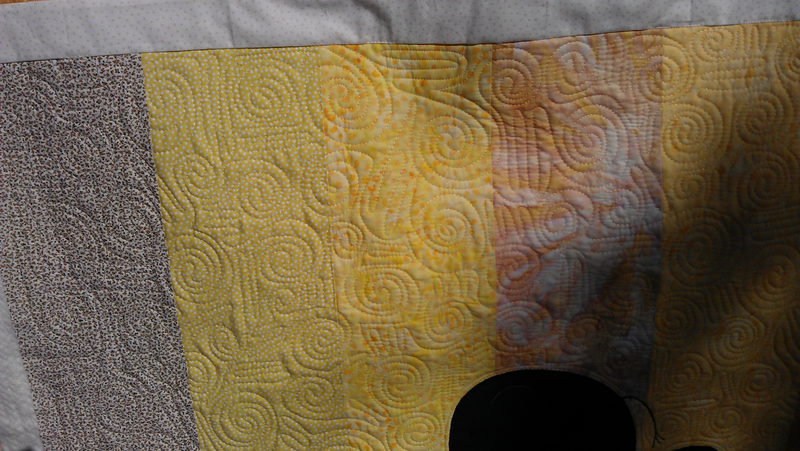 You can still see puffiness in the cream band at the top — I deliberately didn’t quilt this area. 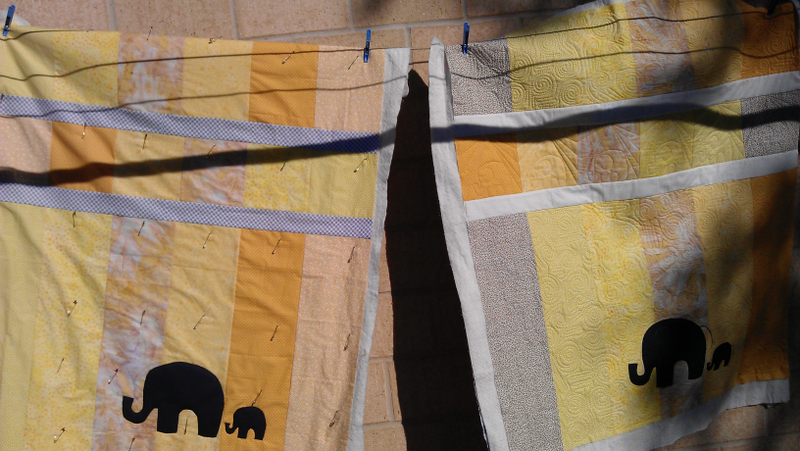 This final photo (below) shows both quilts on the line — the one on the left has no quilting, while the one on the right is quilted and is now ready for trimming and binding. In my opinion, quilting makes the quilt, and brings it to life. The phrase “it’s not a quilt til it’s quilted” may apply. I remember when the term “quilt” referred to any 3 layered blanket/comforter covering. So much has changed in the last few years/decades!!!!! !